Whether it is reading in bed or walking from your tent to a bathroom during a camping trip, Head Lites from Hog Wild Toys make lighting up dark spaces fun. These adorable plush animal heads that kids can wear feature LED lights for eyes. 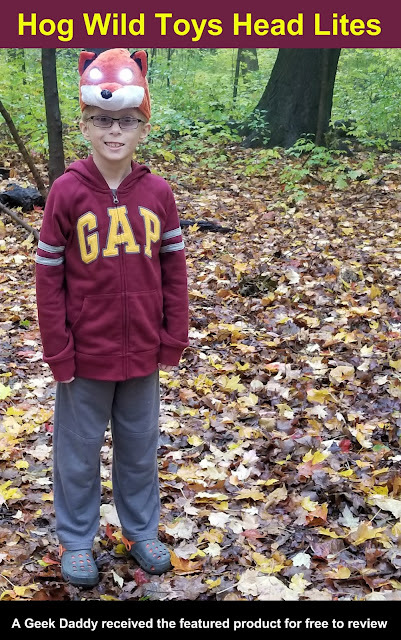 My son wore his Head Lite outside the other night to get something out of the back yard after dark and I have to say it was impressive how brightly his path was illuminated by this plush hat. They also provide the perfect amount of light for reading. My daughter wears her Head Lite all the time in the evening to avoid eye strain while reading. There are eight cute Head Lite animal designs to choose from ranging from chickens to unicorns. Each of the characters' eyes can be independently be adjusted (up, down and off to the side) so the stream of light can be shined just where it is needed. Just place two AA sized batteries in the hat and the lights can be turned on simply by touching one of the ears to click them on and off. My kids really like the animal themes of these Head Lites and use them quite a bit more than I actually expected they would. In addition to using around the house, we've taken the kids' Head Lites on several camping trips and they have been really handy to have around after the sun has gone down. From our experience the lights have worked great plus the product has been easy to use along with being very durable and dependable. 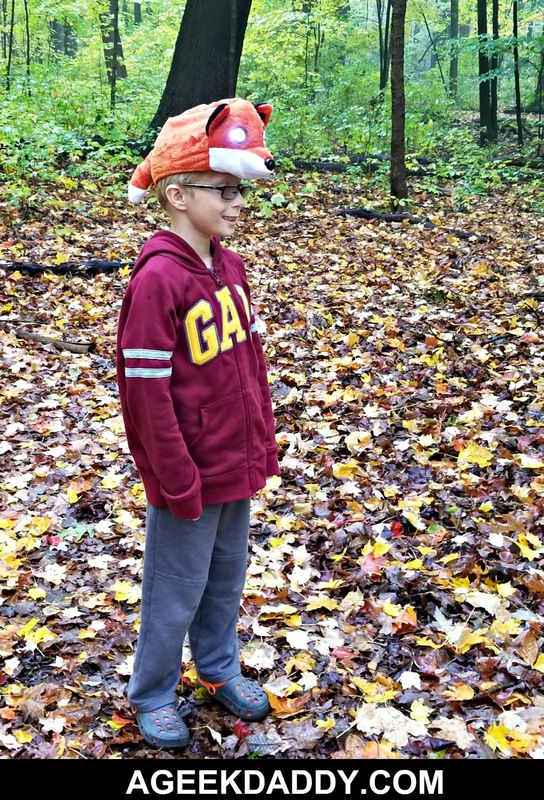 The fun factor of the plush animal heads make Head Lites more than just a wearable head lamp. Because of the enjoyment and usefulness my family has gotten out of Hog Wild Toys Head Lites, I'm giving them A Geek Daddy nod of approval. Hog Wild Toys Head Lites are a wildly fun way to light up the night. My kids would love one of those hats! I like the fox one. I think my youngest would like that one the most. Oh my goodness!! I love these. I can't even decide which one I would pick. I love the cow and the pig ones. I can see where they have already come in handy for your kids! These are just adorable! It would make a wonderful holiday gift for my nieces and nephews. That's cute! It certainly looks like fun. Could be fun to chase your friends on a summer evening wearing these. Oh my goodness! Those are the cutest head lites for kids! I could see where the lite would be helpful when camping, too! That's a great idea! That is such a cute hat. My kids would really love to try on one of those. There are so many adorable animals to choose from. Ok seriously? THIS is AMAZING!!! I want them for me? Think it would fit my adult head? What a cute idea - and maybe it would make those who don't like to read a little excited to use it and read. These are too cute! Love the little fox head one. 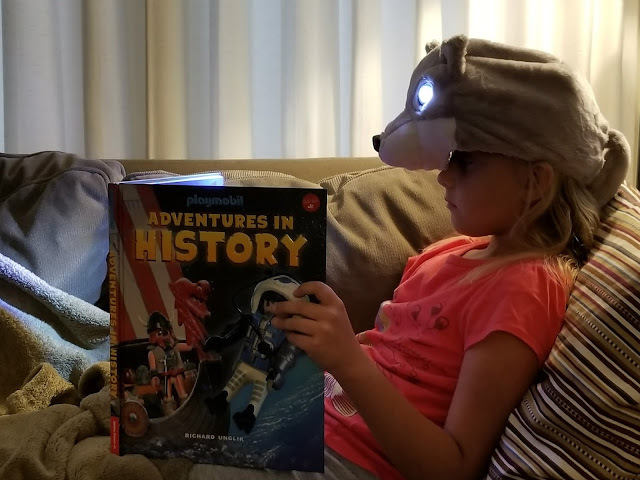 What an absolutely lovely head light lamp this is - perfect for reading. My kids would love to have this, I know! My 11 year old especially loves things like that! Now those would be perfect for the grand kids Christmas gifts. And they're unique as well. Those are kind of cool. I wonder whether my daughter would like that and appreciate it. I will have to check to see what she thinks. I still don't have all the christmas gifts yet so I'm working on it. OMG so cool! GReat gift idea and I'm sure it's one the kids LOVE! My nephew loves to read - so this is just awesome!